Traces is a soulful effort that focuses on Henriksson’s vocals, bolstering them through the inclusion of a folk-infused instrumentation. The instrumental arrangement that is built through this introductory track expands to create something intense and will resound loudly with listeners long after the title has ceased. Fly slows things down and imbues a more introspective and atmospheric sound to Henriksson’s vocals. The tender piano that plays at the bottom of the track provides the perfect counterpoint to Henriksson’s soaring voice. Evening Star builds upon the slight Irish influence that was initially heard during Fly, as Henriksson creates a track that is heavily narrative without losing any of the carefully constructed strings or percussion that has marked previous efforts on Traces. Always Near is a late-album effort that intertwines vocal and instrumental into a very organic cut. The track gradually increases speed on the back of Henriksson’s vocals. The track has a neo-classical / musical touch to it that stands apart from the rest of Traces. It is Henriksson’s dedication and supremely inviting vocals that make this track into a winner. The last few songs on Traces – I Feel, Soulscape, and Calling – unite to create a deep, intimate look into the nuances of Henriksson’s singing and musical styles. Calling completes Traces with an amalgamation of current and early twentieth century Irish music, replete with a rolling motion that mimics the sea. 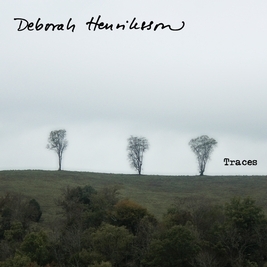 Traces is an always that showcases all sides of Henriksson while providing enough space to allow for Deborah to expand for subsequent releases. Make sure to purchase a copy of the album if you are a fan of strong female singers, world music, or bold new blends of styles from the past and the present.